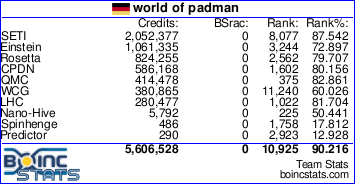 On October 4th of 2013 the World of Padman BOINC team already has crossed the magical 1.5 million credits line. It took the team a couple of years to achieve this goal. If you remember, we reported about the 1 million credits milestone back in early 2008. Man that’s a long time ago. The team’s activities have been running low since then. The WoP BOINC team was founded in 2006 with a list of several projects like Climate Prediction, Einstein@Home, SETI@Home to point out some of them. The idea behind is to bring existing BOINC users and the World of Padman community together as one team. If you are running a BOINC client, feel free to join the team. Further information can be found by looking into the BOINC thread of our community forum or by visiting our World of Padman profile on boincstats.com to get a complete overview over all running projects. We are excited to watch the team achieving 2 million credits. Happy number crunching!